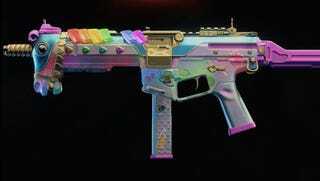 There’s a pretty unicorn gun that can be earned in Black Ops 4, and other really fun camos and variants can make your gun glow as you perform well. Treyarch is doing a great job with the camos and variant guns for this year’s Call of Duty, and I’m on a mission to unlock them all. Camos for your weapons are earned by completing challenges such as headshots or one-shot kills, which is a standard practice for Call of Duty. Past games have started us out with basic tiger stripes, digital camo, and solid colors. Black Ops 4 starts you off with much prettier standard options, but it’s the special camos that are stealing the spotlight. Diamond and Dark Matter are usually the most sought-after camos in a Call of Duty game. You start off by unlocking the standard camos for each weapon’s challenge requirements until you unlock the gold camo. Then unlocking all the gold camos for a weapon class will award you with Diamond. Unlocking Diamond for all classes will unlock the final Dark Matter camo. Black Ops 4 definitely wants you to feel the hype as you go on a killstreak, because these camos will react to your performance. Diamond will turn different colors as you earn the “Bloodthirsty” 5 killstreaks, and if you’re lucky or badass enough to hit a 35 streak, the camo will change to a rainbow animation. Dark Matter will also react and glow brighter as you work towards a massive killstreak. YouTuber SeanEDawgz has a video of the animated gold camos and kill progression of the Diamond and Dark Matter camos. In addition to these spectacular camos, you can also grind to unlocking the Reactive and Mastercraft versions of the weapon variants, which is how you’ll unlock that majestic GKS unicorn gun. YouTuber HollowPoiint has a video of the GKS unicorn in action, showing off how the gun has eyes and hair that move around. Treyarch recently added a reward progression system called Contraband Streams, which is similar to Fortnite’s Battle Pass, but you don’t have to buy anything extra. Everyone earns the gear simply by playing standard multiplayer and Blackout. There are cool skins for the Specialists, new emotes, and cosmetic-only weapon variants. Nothing here will give you a competitive edge, which is nice to keep that level playing field, but you can look stylish as you play. The weapon variants unlocked in the Contraband Streams will have all the standard camos you’ve already obtained for the weapon type, but they also have their own challenges with Reactive and Mastercraft. You must equip the variant to your loadout, apply the Reactive camo to the weapon, and complete the weapon challenge listed. You start with a weird-looking camo, but that basically serves as a placeholder for the real deal. The actual Reactive camo will appear on your gun once you’ve completed the required challenge. It also reacts and glows as you rack up a high killstreak. The challenges are going to vary, but they’re all pretty basic stuff like getting some number of kills, or kills in rapid succession. The Mastercraft version follows the same process. The Damascus variant of the GKS submachine gun is unlocked at tier 105 of the Contraband stream, so you have quite a grind ahead of you to earn that Mastercraft unicorn. But look at it… isn’t it worth it?